As the storms clear out of the region, officials are out trying to clear the damage. A lot of down limbs and power-lines through the region. KUB reported about 30,000 customers out of power LCUB had another 10,000 plus outlying utilities, there was close to 50,000 homes out of power. The storm proved fatal overnight. 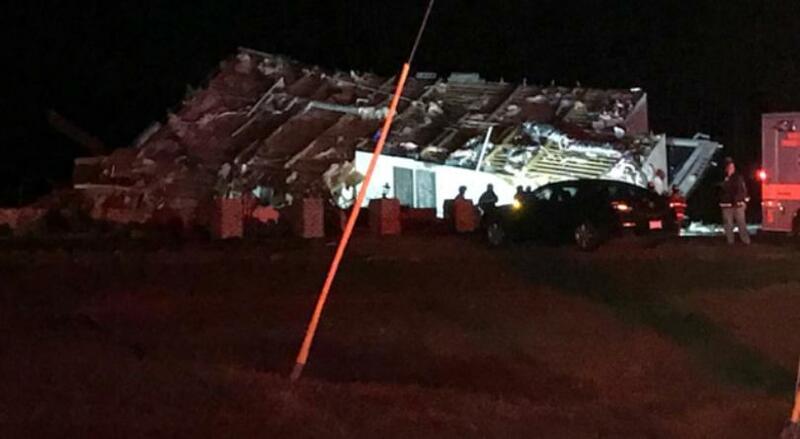 As this system moved through Middle Tennessee a home in Christiana was literally knocked over. Officials believe it was a tornado, but that has not been confirmed. A woman was killed and two others were injured. Rutherford Co. was just one of the many areas that saw heavy winds, lightning, and flooding from the system. Fire officials there said lightening may have been the cause of a fire in a two-story home. Smoke alarms woke up a father and his three children, they were able to get out of the home safely. The Storm Prediction Center from the National Weather Service indicated a report of a possible tornado in nearby Franklin, Tenn.
A Knoxville fire engine is out of commission after it was damaged from the storms this morning. 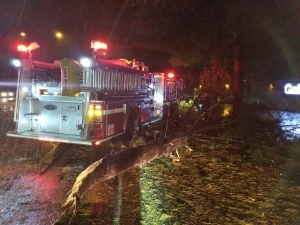 Crews were responding to an alarm at Ten Mile Center early this morning when Engine 21’s windshield was pierced by a tree limb. No one was injured, but the truck was taken out of service and they brought in a reserve.